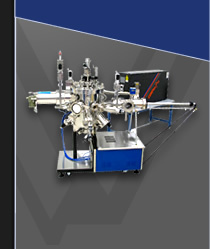 For high vapor pressure materials such as As, P, Te, Sb, Se, S, and others, SVT Associates has engineered a series of Valved Sources to provide large capacity and a highly controlled deposition. Traditional evaporation sources rely on thermal stability and control to determine the deposition rate. With high vapor pressure materials, a small fluctuation in temperature can create a large fluctuation in deposition rate. The temperature fluctuations can be seen during ramping sequences or during shutter transients (due to shutter actuation). The SVT Associates Valved Evaporation Sources have the advantage of integrating a mechanical valve to limit the conductance from the evaporation (sublimation) reservoir to the growth chamber. A constant temperature may be maintained and the valve position is used to control the flux allowing for a stable and reproducible deposition rate. 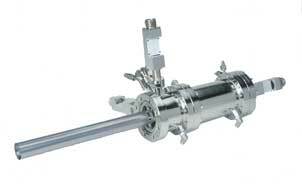 This provides a stable, controllable Molecular Beam Epitaxy Source. In the Valved Cracker Source, an extended temperature region may be implemented in the top region of the source to thermally dissociate larger molecules to smaller, more reactive species. This is particularly useful in III-V MBE Systems or II-VI MBE Systems, for MBE growth involving As, P, Te, Sb, Se, and S. Cracking the larger molecules reduces material consumption by increasing incorporation into the growing film as well promoting stoichiometry at the substrate level. An all ceramic valve design is available for increased longevity with corrosive materials. Complete controller packages, integrated shutters, integrated water cooling for the cracking zone, and valve automation packages are available. Please contact SVTA where one of SVT Associates' experts can help determine the appropriate source for your application.